Underwater drones are changing the way scientists study the sea. Five miles offshore from the Golden Nugget casino, Michael F. Crowley, a marine scientist at Rutgers University, heaves three lifeboat-yellow drones off the back of his research vessel. The gliders, as he calls them, are winged and propellerless, like miniature Tomahawk missiles. Two are on loan from the Navy, and one, Rutgers’s own, is pockmarked from a past shark attack. As they slink into the Atlantic to begin a monthlong mission, they join a fleet of 12 others across the Eastern Seaboard, from Nova Scotia to Georgia. being used in a large-scale ocean-survey experiment in the Atlantic. 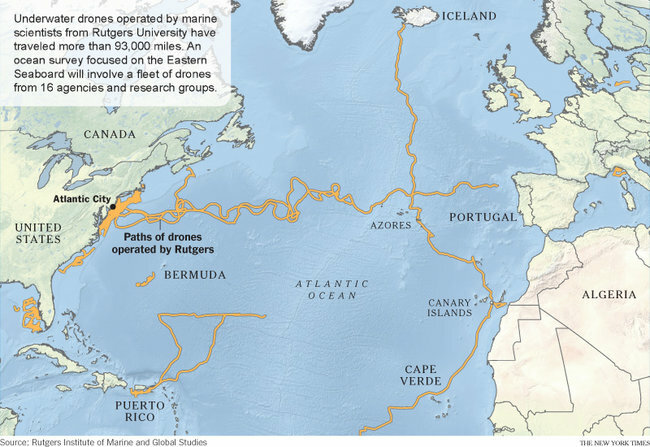 These drones are the centerpiece of “Gliderpalooza,” a collaborative ocean-survey experiment coordinated by 16 American and Canadian government agencies and research teams. By pooling their resources, including satellites, radar stations, research buoys and the gliders, the teams hope to capture the most complete picture yet of the Atlantic’s many mysterious underwater movements — from deepwater currents to migrating fish. Ocean researchers are also planning to deploy gliders in the Western Pacific to help forecast storms like Typhoon Haiyan. While a typhoon’s path is largely influenced by atmospheric changes, gliders can help predict a storm’s intensity, which is affected by ocean temperatures. The mid-Atlantic experiment heralds a new direction in ocean research. Despite a network of ocean-observing satellites and several projects that have seeded the seas with data-logging buoys, the sheer size and complexity of the oceans still mask much of what goes on underwater. At a time when forecasts of storms, currents and the effects of climate change have never been needed more, the researchers hope their flotilla of gliders will provide a new perspective. 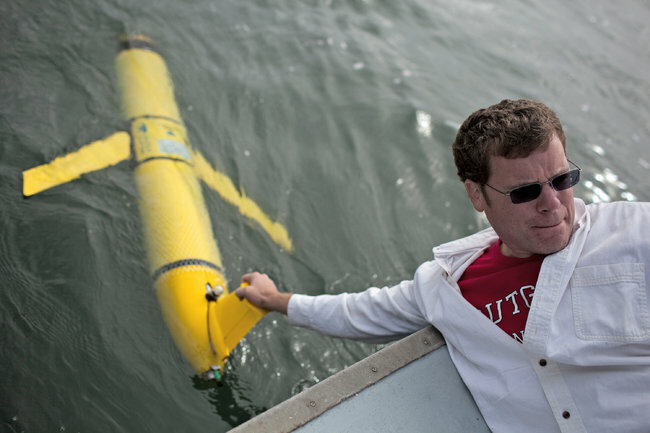 The battery-powered gliders continually dive in long swooping curves, taking snapshots of the ocean’s temperature, currents and other features at a range of depths. They reach a maximum depth of roughly 650 feet, though they can be configured to go deeper; that is relatively shallow for most of the ocean, but more than deep enough for continental shelves, which are on average 460 feet below sea level and can extend from a few thousand feet to hundreds of miles offshore. Each glider costs $125,000 to $150,000, depending on instrumentation, a bargain compared with traditional methods. “A research vessel can cost anywhere from $35,000 to almost $100,000 per day,” said Oscar M. Schofield, an ocean scientist at Rutgers who is leading the experiment. While each of the 15 gliders has its own mission, the data they collect is being combined at Rutgers to investigate much larger questions. Perhaps the most pressing question is the shape and movement of the seasonal “cold pool,” a poorly understood body of water that rests at the bottom of the Northeast Continental Shelf. Researchers and fishermen have known for almost a century that while the coastal Atlantic warms in spring and summer, an enormous stretch of water stays abnormally frigid, trapped at the bottom. This cold pool stretches almost the length of the continental shelf, in a shifting band from Cape Cod to Cape Hatteras. As fall returns and the surface of the Atlantic starts to chill, the cold pool will either slowly homogenize with the cooling surface waters or mix together rapidly as storms move over the ocean. But much is still largely unknown. In August 2011, when Hurricane Irene moved over the cold pool, “the hurricane mixed the warm water at the top of the ocean and the cold pool at the bottom, which extinguished the intensity of that storm,” Dr. Glenn said. Researchers, who have relied on satellites, hope to get a different perspective from the gliders. Ocean drones have been used around the world for a decade, often to survey conditions too dangerous for humans. “But this represents an important step in the maturation of the technology,” said Timothy J. Cowles, a researcher with the Ocean Observatories Initiative, who is not involved with Gliderpalooza. “It’s one thing to have a single glider making its own measurements, but it’s quite another thing to have an entire fleet of gliders coordinated between various research groups." Though the gliders swim at a snail’s pace, a little over one mile an hour, their mobility grants the researchers an unprecedented capacity to adapt their experiments, said Joshua T. Kohut, a Rutgers oceanographer with the Maracoos research team. There are several models of submersible research drones on the market, but the Gliderpalooza fleet consists of propellerless Slocum Gliders, designed by the Teledyne Webb Research Corporation. They move by adjusting their buoyancy — taking on and expelling small amounts of water to rise and fall in the ocean. Two wings transform this up-and-down movement into forward momentum, propelling the robot in a continuous chain of swoops. 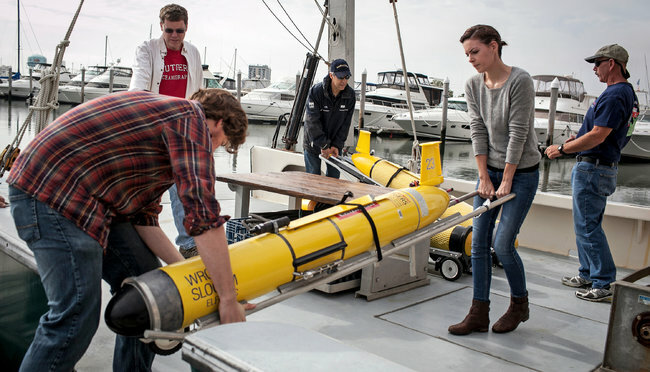 The Navy, the largest user of underwater drones, has 65 gliders helping forecast ocean weather worldwide through the Naval Oceanographic Office, including the two on loan for Gliderpalooza. “Participating in this experiment gives us the opportunity to evaluate the quality of our own ocean models and to share the lessons we’ve learned,” said Kenneth P. Grembowicz, the oceanographic director at the office. Many of the research teams are already planning new, collective experiments for their gliders. 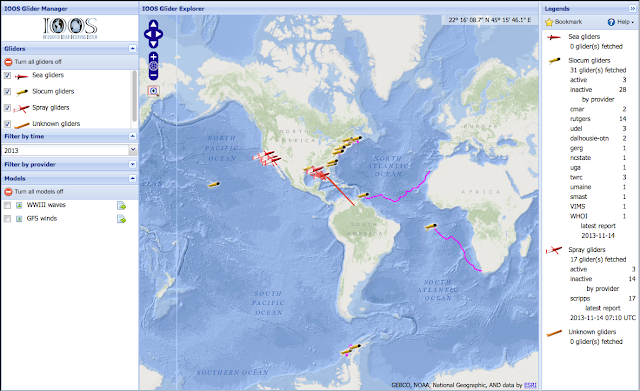 Of the two glider missions on track for next year, one will study and forecast storms on the East Coast, while another will take Gliderpalooza’s multi-institution approach and apply it on a global scale. “These are an infinite number of ways we can explore the ocean that we couldn’t before,” Dr. Glenn said.